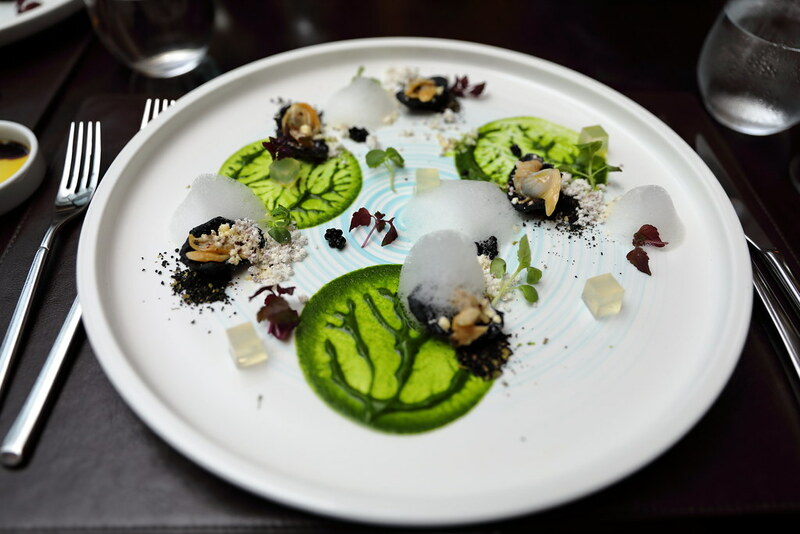 il Cielo on the rooftop of Hilton Hotel, on level 24, welcomes Spring with a new menu that features seasonal harvest from the Italy and Japan. Some of the highlights in the spring menu, includes the Hokkaido Asari clams, fresh bamboo shoots and Amadai fish from Japan as well as black truffle, white asparagus and cured Culatello ham from Italy. 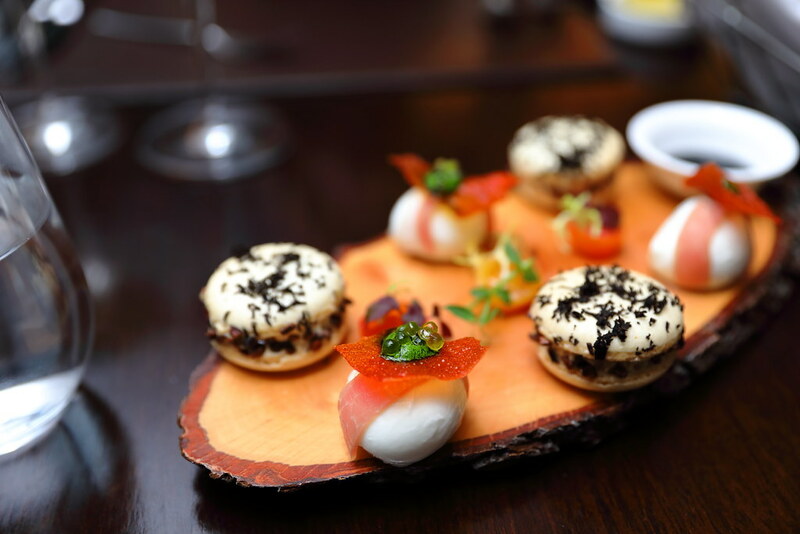 Our six course degustation menu started with the Amuse Bouche which consists of Mozzarella with tomato chip and parma ham, and Foie Gras Macaron. I prefer the foie gras macaron for its intensity, and rather unique combination of sweet and savoury. Our next dish is Marinated Japanese Asari Clam 'Vongole Bianco' ($32) that is paired with Baerii caviar, white wine jelly, aglio olio peperoncino powder. The dish looks very spring with the circle of green parsley sauce. The highlight is actually the Asari Clam, though small in size but is very sweet. The Tortellini in Blodo ($28) clearly showcases Chef Yohhei Sasaki culinary philosophy of incorporating Japanese fair into Italian cuisine. The homemade tortellini stuffed with bamboo shoot ragout and truffle paste comes in a rich Japanese style chicken broth and shaved black truffle. 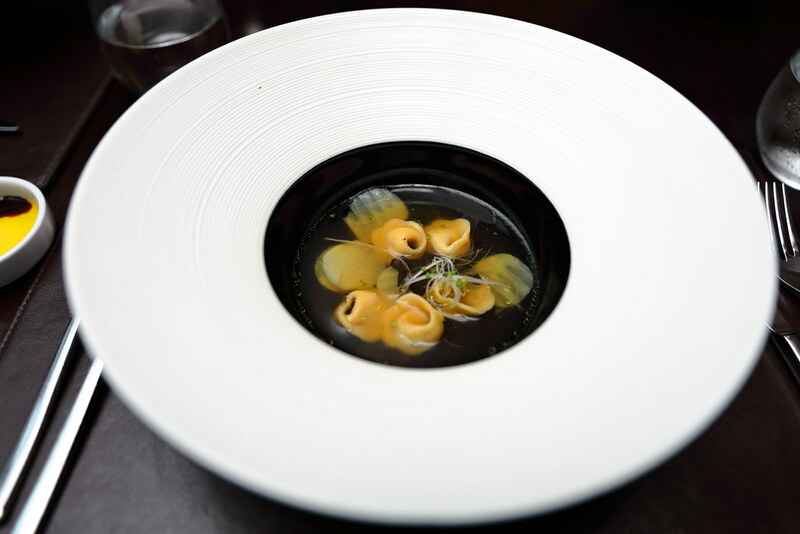 The little tortellini has an enjoyable chewy bite to it while the refreshing clear soup, delivers a gentle smoothing element to the dish. 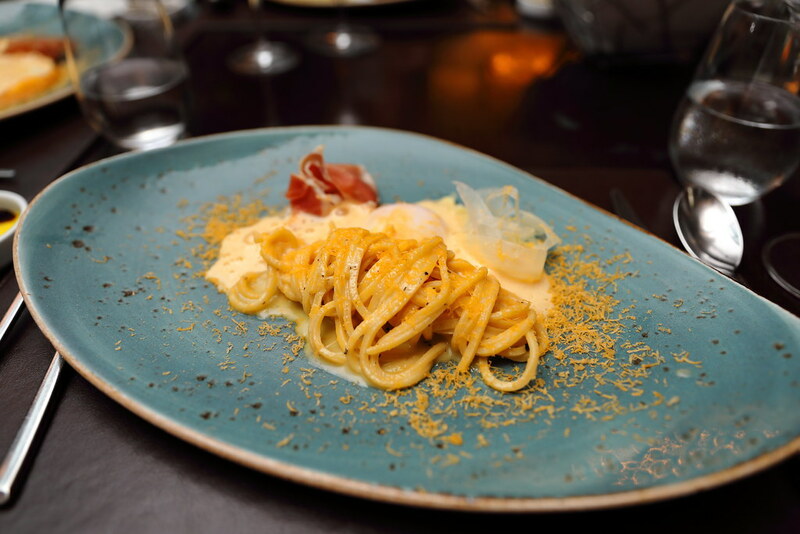 The Homemade Chitarra alla 'Carbonara' ($38) is a deconstructed cabonara which consists of white asparagus salad, herb poached egg, culatello ham and carbonara espuma. Give it a good toss, mixing everything together to enjoy the texture of the Chitarra pasta, which has a thicker and more doughy. For the mains, diner has an option of choosing the Maple Duck Variation ($48) or Pan Fried Amadai Fish ($56). 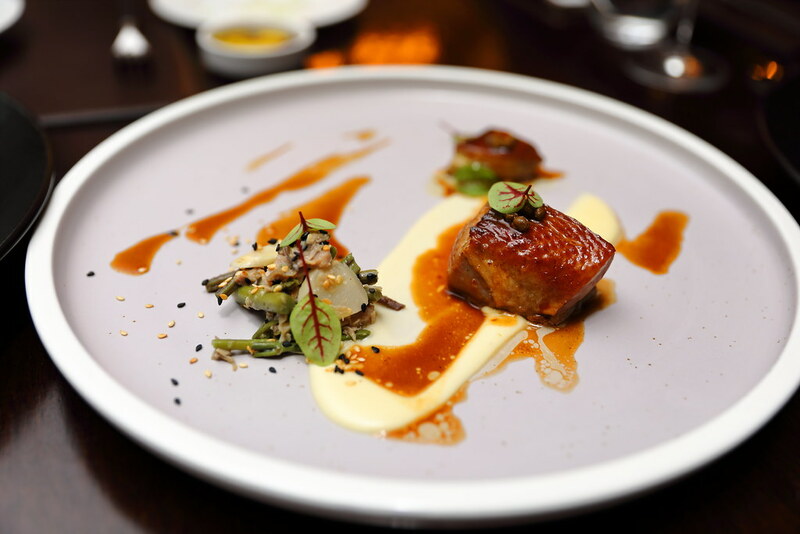 Diner can find several components on the Maple Duck Variation dish such as roasted duck breast, Japanese spring mountain vegetables, duck leg confit salad and pan-fried foie gras. The duck breast itself was cooked beautiful but the skin was somehow rather elastic, which I have difficulty breaking it down. 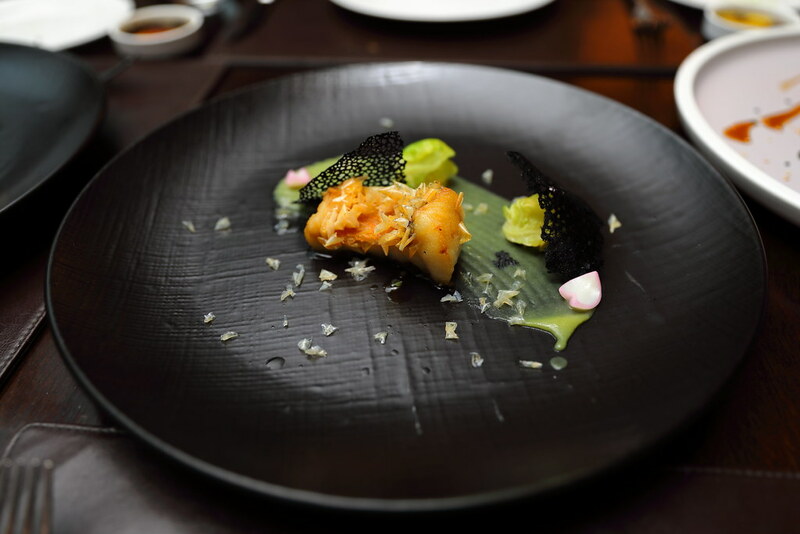 For the Pan Fried Amadai Fish ($56), Chef Chef Yohhei Sasaki has even used the fish scales to provide the extra crispiness as a crumble. While it is an enjoyable dish, I thought it needs a bit more acidity to heighten the flavours. It is a bit too clean tasting for me. Last but not least, wrapping up the six course degustation menu for dessert is the Zuppa Inglese con Fragola ($20). 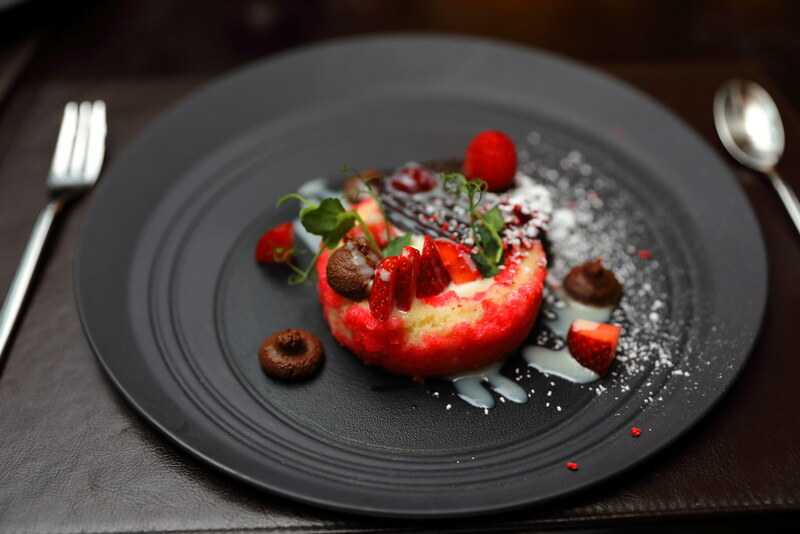 The traditional Tuscany dessert is paired with Japanese ichigo (strawberry) and variation of valrhona chocolate. I don't really have a sweet tooth, so I like the fact that the sponge cake layered with custard is light and airy, and more importantly not overly sweet. This is complemented by the fruity sweetness from the Japanese ichigo. Diners can opt for the six-course degustation menu ($138) or select from the the a la carte menu priced from $28 onwards. The spring menu will be available from 12 March to 30 April 2018.